If you need any convincing that the technique for producing speed in the swing is the same for power, then have a look at two swings I have made recently with different drivers. 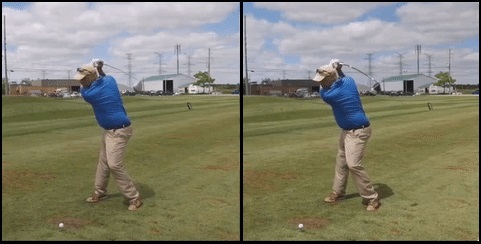 The swing on the left was with the Momentus Power Driver swing, so of course the technique for this swing would have to be one that provides power and leverage to move the much heavier club than a standard one. The swing on the right was performed with my regular Taylormade RBZ, which is standard length and weight, so a much lighter club than the Momentus, which means I’m swinging for speed. So, this should put to rest the canard advanced by the Modern Golf Swing proponents that today’s pros swing differently because of the lighter equipment than the Classic Golf Swing era – the Momentus Power Driver is heavier than any persimmon club would have ever been back in those days, and the TaylorMade RBZ is about as light a driver as you’re going to swing now. This is why today’s players are breaking down in their 20’s and 30’s – not because they’re fitter and stronger than the players of yesteryear, but because they’re not swinging properly. If swinging a heavy club required a different type of swing action than the one I use for maximum speed, then you’d see the difference above. I’ve achieved over 150 mph ball speed hitting the Momentus, which is less than 10% slower than the average ball speed on Tour, and I’ve achieved over 180 mph ball speed with that particular TaylorMade RBZ, and I would use the same swing technique to swing both clubs. There’s no difference – the way to swing a modern club is the same way you would have swung the heavier persimmon drivers of the classic era. This entry was posted in Classic Swing, E = MCS, MCS Golf Swing, Modern Driver, Modern Swing, Momentus Heavy Driver and tagged Classic Golf Swing, DJ Watts, E = MCS, Modern Driver, Modern Golf Swing, Momentus Heavy Driver, WAX Golf on June 5, 2017 by D Watts. Good looking swings DJ. Looking forward to being able to teach it myself when I coach, once I understand it fully and can apply it subconsciously. Most classic swingers use the hands and arms to power the swing, especially Snead, Cotton and Armour. They emphasize the use of the hands to power the swing, and when they take the club back, the hips are allowed to turn due to the pulling of the hips around as the arms went back. This is what I personally do. I use my hands and arms to power the club and swing it through. This is what I personally do. I use my hands and arms to power the club and swing it through. Could be the answer to the question you asked recently on the Forum regarding power and speed – the hips and legs, not the arms and hands, are what should power the swing, and if you can get to doing that, you’ll really find that power aspect kicking in. Now, I have used a visual in the past to describe the arms and hands pulling the hips around on the back swing, then the hips and legs leveraging the arms and hands down on the down swing – but the first part is more a “feel” of what is going on, and that could be what Snead, Cotton and Armour were describing. –That’s why I was hoping that you’d include a segment on the takeaway, in your new production. I don’t think it works like that, and that’s why I don’t like the word TAKEaway. I’ve got an open mind on the subject (if something works for somebody, they should keep doing it), but it seems like the concept should be to get the left arm swinging, and you don’t do that with hands & arms. What I’ll be showing will be that, given the proper position at address, the “takeaway” or back swing beginning is largely initiated by the weight transfer. Get the position right, and on the simple shift of balance to the right foot, the takeaway begins itself, but it (the action) is primarily in the hips and legs.